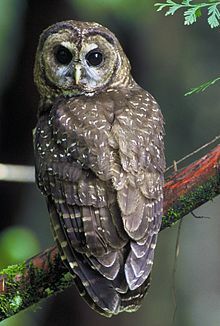 The northern spotted owl (Strix occidentalis caurina) is one of three spotted owl subspecies. A western North American bird in the family Strigidae, genus Strix, it is a medium-sized dark brown owl sixteen to nineteen inches in length and one to one and one sixth pounds. Females are larger than males. The wingspan is approximately 42 inches. The northern spotted owl primarily inhabits old growth forests in the northern part of its range (Canada to southern Oregon) and landscapes with a mix of old and younger forest types in the southern part of its range (Klamath region and California). The subspecies' range is the Pacific coast from extreme southern British Columbia to Marin County in northern California. It nests in cavities or on platforms in large trees and will use abandoned nests of other species. Spotted owls form long-term pair bonds (divorce is an uncommon occurrence) and remain in the same geographical areas year after year. Most spotted owls inhabit federal lands (Forest Service, Bureau of Land Management, and National Park Service lands), although significant numbers occur on state lands in all three states, and on private and tribal properties. The northern spotted owl is primarily nocturnal. Its diet consists mainly of wood rats (Neotoma sp.) and flying squirrels, although it will also eat other small mammals, reptiles, birds and insects. They will often swallow their catch whole and regurgitate pellets of indigestible hair, feathers and bones. Males and females both hunt, except during nesting, when males do most of the hunting. They can take prey on the ground and in flight. Northern spotted owls are one of the few owls with dark-colored eyes. Most owls have yellow to red-orange colored eyes. The northern spotted owl is intolerant of habitat disturbance. Each nesting pair needs a large amount of land for hunting and nesting, and will not migrate unless they experience drastic seasonal changes, such as heavy snows, which make hunting difficult. Their flight pattern is distinct, involving a series of rapid wingbeats interspersed with gliding flight. This technique allows them to glide silently down upon their prey. Northern spotted owls are ready to reproduce at two years of age, but do not typically breed until they are three years old. Male and females mate in February or March and the female lays two or three eggs in March or April. She then incubates the eggs for 30 days. After hatching, the young owls remain in the nest where the adult female provides primary care until they fledge in 34 to 36 days. The hunting and feeding is done by the male during this time. The young owls remain with the parents until late summer to early fall. They leave the nest and form their own winter feeding range. By spring, the young owls' territory will be from 2 to 24 miles from the parents. There are fewer than 100 pairs of Northern Spotted Owl left in British Columbia, Canada, 1,200 pairs in Oregon, 560 pairs in Northern California, and 500 pairs in Washington. Washington alone has lost over 90 percent of its old growth forest due to logging which has caused a 40-90 percent decline of the Northern Spotted Owl population. The worldwide IUCN Red List of Threatened Species status for the spotted owl species is "Near Threatened" with a decreasing population trend. As the IUCN Red List does not track subspecies, this status is applied to species across its whole range in Canada, the United States and Mexico. The Canadian population, declared endangered by the Committee on the Status of Endangered Wildlife in Canada under the 2002 Species at Risk Act, now[when?] numbers less than 100 breeding pairs of birds. In British Columbia, Canada, as of 2010[update], only 6 pairs are known in the wild, down from historic numbers of 500 pairs. The northern spotted owl was listed as a threatened species under the Endangered Species Act throughout its range of northern California, Oregon and Washington by the United States Fish and Wildlife Service on June 23, 1990 citing loss of old-growth habitat as the primary threat. The USFWS previously reviewed the status of the northern spotted owl in 1982, 1987 and 1989 but found it did not warrant listing as either threatened or endangered. Logging in national forests containing the northern spotted owl was stopped by court order in 1991. In 2007 a Captive Breeding and Release Program was created in Langley, British Columbia, Canada, with the goal of producing owls in captivity for release into protected habitat to prevent the extirpation of the species from Canada. The short-term goals of the Program include growing the captive population to 10 breeding pairs and releasing 10-20 offspring per year into the 300,000 hectares of protected old-growth forest. Long-term the Breeding Program aims to recover the wild population to self-sustaining numbers, approximately 300 adults, over the next 10–20 years. Thus far the Program has produced 8 captive-bred Northern Spotted Owls, including 2 second-generation offspring, and plans to begin releases in 2018 or 2019. In 1990, the logging industry estimated up to 30,000 of 168,000 jobs would be lost because of the owl's status, which agreed closely with a Forest Service estimate. Harvests of timber in the Pacific Northwest were reduced by 80%, decreasing the supply of lumber and increasing prices. However, jobs were already declining because of dwindling old-growth forest harvests and automation of the lumber industry. One study at the University of Wisconsin–Madison by environmental scientists argued that logging jobs had been in a long decline and that environmental protection was not a significant factor in job loss. From 1947 to 1964, the number of logging jobs declined 90%. Starting with the Wilderness Act of 1964, environmental protection saved 51,000 jobs in the Pacific Northwest. The controversy pitted individual loggers and small sawmill owners against environmentalists. Bumper stickers reading Kill a Spotted Owl—Save a Logger and I Like Spotted Owls—Fried appeared to support the loggers. Plastic spotted owls were hung in effigy in Oregon sawmills. The logging industry, in response to continued bad publicity, started the Sustainable Forestry Initiative. While timber interests and conservatives have cited the northern spotted owl as an example of excessive or misguided environmental protection, many environmentalists view the owl as an "indicator species," or "canary in a coal mine" whose preservation has created protection for an entire threatened ecosystem. Protection of the owl, under both the Endangered Species Act and the National Forest Management Act, has led to significant changes in forest practices in the northwest. President Clinton's controversial Northwest Forest Plan of 1994 was designed primarily to protect owls and other species dependent on old-growth forests while ensuring a certain amount of timber harvest. Although the result was much less logging, industry automation and the new law meant the loss of thousands of jobs. However, new jobs were created for biologists conducting surveys for spotted owls and other rare organisms that occur in their range. The debate has cooled somewhat over the years, with little response from environmentalists as the owl's population continues to decline by 7.3 percent per year. In 2004 the U.S. Fish and Wildlife Service reaffirmed that the owl remained threatened, but indicated that invasion by barred owls into the range and habitat of the spotted owl was also a cause of declining spotted owl populations. In 2007, the USFWS proposed a new recovery plan intended to guide all management actions on lands where spotted owls occur, and to aid in recovery of the species. Early proposals were criticized by environmental groups as significantly weakening existing protections for the species. The Obama administration reversed proposals that would have increased logging on Bureau of Land Management administered lands. Recent discussion has been focused on two novel approaches. One of these would emphasize wildfire management as key to owl persistence on the east side of the Cascades, and in the Klamath province. Another proposal, on control of barred owl populations through culling, has been criticized by some animal rights and other activists. Federal biologists were considering in 2010 whether to kill barred owls to see if that would help the spotted owls. Northern Spotted Owls range on 500,000 acres of the 7.6 percent of private forestlands managed by Native American tribes in the state of Washington. The U.S. treats tribes as sovereign nations, therefore each tribe develops their own management plans for the northern spotted owls in their area. However, the government expects all private land owners (including native tribes) to comply with the Endangered Species Act. ^ "Northern Spotted Owl". Defenders of Wildlife. Retrieved October 30, 2008. ^ a b c Brokaw, Jeanne (Nov/Dec 1996). "Does Anybody Give a Hoot?" Mother Jones. Accessed April 3, 2013. ^ "Basic Facts About Northern Spotted Owls". Defenders of Wildlife. March 2012. Retrieved February 24, 2016. ^ "Northern spotted owl — Conservation Northwest". www.conservationnw.org. Retrieved February 24, 2016. ^ BirdLife International (2013) Strix occidentalis. The IUCN Red List of Threatened Species. Version 2014.3. ^ Pynn, Larry (March 24, 2010). "Light dims on B.C. 's wild spotted owls". The Vancouver Sun. Archived from the original on March 28, 2010. Retrieved March 27, 2010. ^ Federal Register 55 FR 26114-26194. Northern Spotted Owl Five-year Review at U.S. Fish and Wildlife Service. ^ a b c Satchell, M. (June 25, 1990) U.S. News & World Report, Vol. 108, Issue 25, p. 27. ^ Freudenburg, William R.; Lisa J. Wilson; Daniel O'Leary (1998). "Forty Years of Spotted Owls? A Longitudinal Analysis of Logging-Industry Job Losses" (PDF). Sociological Perspectives. 41 (#1): 1–26. doi:10.2307/1389351. JSTOR 1389351. Archived from the original (PDF) on August 30, 2006. Retrieved November 12, 2008. ^ Guglielmino, Janine (Summer 1997). American Forests, Vol. 103, Issue 2, p. 6. ^ Adams, Larry (December 1999). Wood & Wood Products, Vol. 104, Issue 13, p. 62. ^ "American Lands Alliance Action Alert". Americanlands.org. May 15, 2007. Archived from the original on June 13, 2007. ^ Knickerbocker, Brad (June 27, 2007). "Northern spotted owl's decline revives old concerns". Christian Science Monitor. Retrieved June 27, 2007. ^ "How Should We Manage the Barred Owl?" Olympic Peninsula Audubon Society. Accessed April 3, 2013. ^ Johnson DH, White GC, Franklin AB, Diller LV, Blackburn I, Pierce DJ, Olson GS, Buchanan JB, Thrailkill J, Woodbridge B, Ostwald M. (2008). Study designs for Barred Owl removal experiments to evaluate potential effects on Northern Spotted Owls. Report prepared for the U.S. Fish and Wildlife Service, Lacey, WA and Yreka, CA. Olympia, WA: Washington Department of Fish and Wildlife. 32 p.
^ Verhovek, Sam Howe (June 4, 2007). "To protect spotted owl, larger rival is targeted". Los Angeles Times. ^ Livezey KB (2010). "Killing barred owls to help spotted owls I: a global perspective" (PDF). Northwestern Naturalist. 91 (2): 107–133. doi:10.1898/NWN09-37.1. JSTOR 40856470. Archived from the original (PDF) on May 25, 2017. ^ Livezey KB (2010). "Killing barred owls to help spotted owls II: implications for many other range-expanding species". Northwestern Naturalist. 91 (3): 251–270. doi:10.1898/NWN09-38.1. JSTOR 40983223. ^ "WFPA - NSO Conservation in WA - Tribal Forestland". www.northernspottedowl.org. Retrieved February 24, 2016. Wikimedia Commons has media related to Strix occidentalis. This page was last edited on 9 February 2019, at 22:07 (UTC).